With beaches that look so perfect they could be reality photo shopped, sophisticated accommodation and a talent for relaxation, the LUX Grand Gaube resort in Mauritius is the ideal place for laid-back romance. 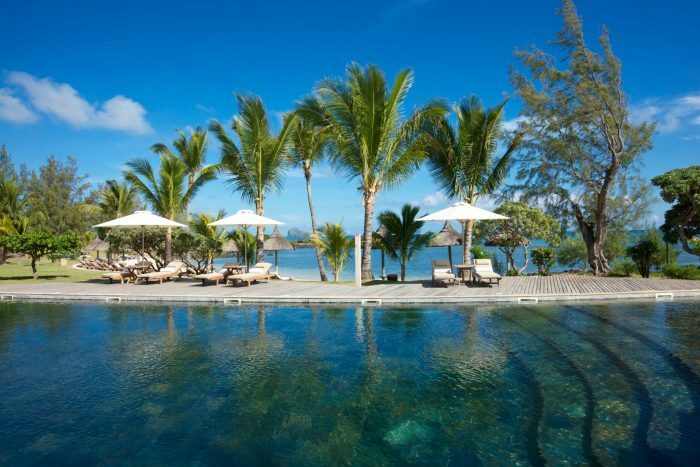 Located just a gentle stroll away from a quiet fishing village on the north coast of Mauritius, LUX Grand Gaube is hidden away in one of the island’s most sublime parts. The resort sweeps around three stretches of white soft sandy beach fringed by palm trees and well-groomed tropical gardens. The rooms and suites look out on to the triple-bay beach and peaceful azure lagoon. The spa menu tempts with its array of massages, body wraps and facials, and also features a steam room, sauna and saltwater plunge pool. The choice of dining options will not disappoint with cuisine from all over the world, the highlight being a classic Mauritian restaurant nestled under one the island’s oldest banyan trees. Treat yourself to some well-deserved TLC in the spacious spa, featuring a steam room, sauna, hot tub, salted water pool and outdoor treatment kiosk. Guest may keep active with a range of activities including yoga, beach volley ball, table tennis, mountain biking, gold, and bocce balls. Explore the stunning coastline with windsurfing, pedal boating, kayaking, snorkeling, a glass bottom boat trip, waterskiing, speedboat ride, catamaran cruise, diving with dolphins, diving, fishing or a seaplane ride. LUX Me Fitness – Release some natural endorphins with a work out in the modern gym. Satisfy your wanderlust and the desire for a luxurious holiday with a honeymoon in exotic Mauritius at LUX Grand Gaube, affording world-class facilities in a jaw-dropping locale. This resorts grants a taste of authentic island living steeped in seduction and indulgence. Newlyweds will delight in the spacious guest rooms with plush furniture and private balconies. Learn a new skill together like cooking or gain a new hobby and try the resort’s various water sports, alternatively try relaxing with a yoga class. Soothe sun-kissed skin with an Ayurvedic ritual at the spa. This resort has plenty of tailor-made activities for you and your partner to make the most of your trip and tune into the gorgeous surroundings. Idle through the fabulous gardens hand-in-hand, stop off at the beach bar for a sunset cocktail and finish with supper under the stars; LUX Grand Gaube embodies perfect romantic scenery and charm. Once-in-a-lifetime honeymoon experiences don’t get much more mind-blowing than LUX Grand Gaube. LUX Grand Gaube’s dining options have something to suit every palate with local Mauritian dishes to international favourites and Mediterranean cuisine all cooked using the freshest ingredients. The Kitchen – The main restaurant serves international and local favourites in a buffet style at breakfast and dinner. The Beach – The Beach invites you to taste the flavours of Mediterranean cuisine served with an impressive wine selection. The Banyan Island Kitchen – An adults own pool and restaurant area serving light snacks and mouthwatering drinks. Café LUX – Sip the hotel’s own signature coffee as you watch the world go by at Café LUX. The Bar – The Bar provides a range of tasty cocktails, spirits, beers and light snacks. Abalone – Serving freshly caught fish and seafood cooked just the way you like it.